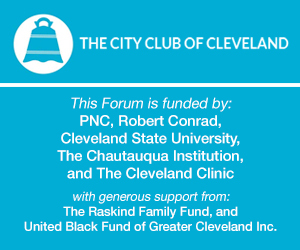 Join us for the first official debate between Mayor Frank Jackson and Ken Lanci, both Democrats, who are running for mayor of Cleveland. Jackson is a seasoned politician who has served on Cleveland City Council and is seeking his third four-year term as mayor. In 2005, he ran against incumbent Mayor Jane Campbell, denying her a second term. In 2009 he easily won re-election against former Councilman Bill Patmon. Lanci is Chairman and CEO of Consolidated Graphics Group, Inc. and announced his candidacy in May of this year. Lanci has never held public office and lost a bid for Cuyahoga County Executive in 2010. By June's deadline, Lanci and Jackson were the only two to submit petitions for candidacy. Jackson and Lanci will face each other in the November 5 election.